When people think of food in Amsterdam they are likely to name waffles, pancakes and fries. While these are all great, there is so much more to the Dutch capital’s culinary scene. 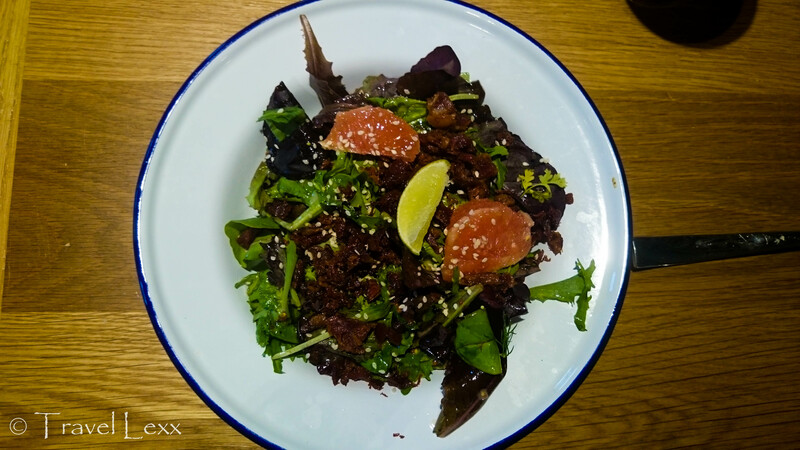 During my recent visit I went on a hunt for good, healthy food and found some great options and managed to indulge a bit too! Here are my favourite 6 places to eat in Amsterdam. Just across the road from the Van Gogh Museum is this great little café. 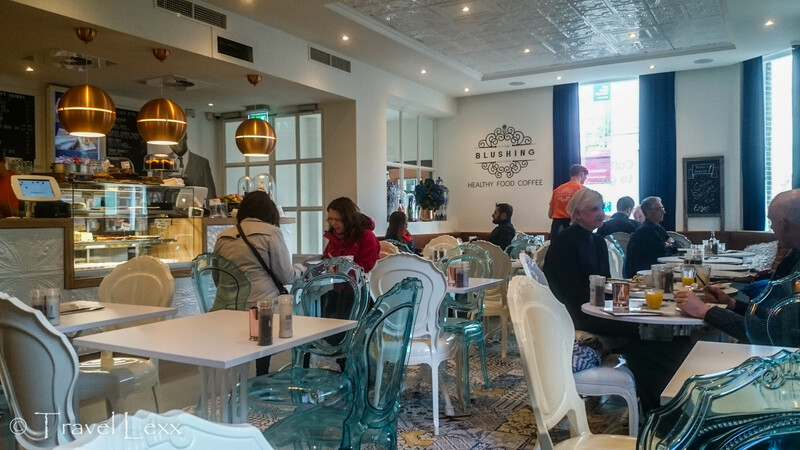 The focus is on healthy food and there are separate options for breakfast, lunch and dinner as well as freshly squeezed juices, delicious healthy smoothies and coffee. I had a whey protein pancake as well as quinoa with a mix of fruit, nuts and chia seeds and both were delicious. There are also gluten-free options. The interior is cosy and there is an outdoor terrace for warmer weather. The place also donates a portion of all proceeds to the Diabetes Fund. Definitely worth checking out if you’re after a healthy break from all the sightseeing. Location: Blushing Amsterda, Paulus Potterstraat 30A. Across the road from Van Gogh Museum and a couple of minutes walk from the Rijksmuseum. Take trams 2 or 5 if coming from Amsterdam Centraal. Oh, I just love food markets. There is just so much choice and it’s a great way to check out the best local food vendors. Amsterdam’s offering, Foodhallen, doesn’t disappoint. 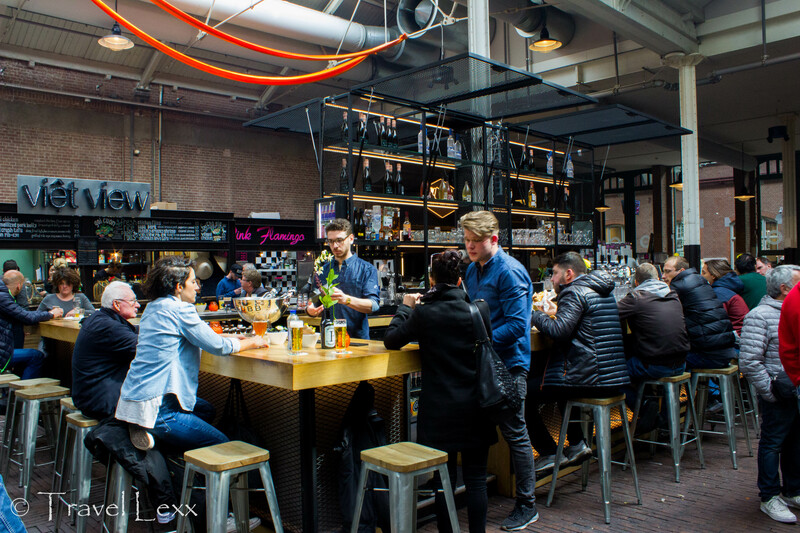 Located in a former tram depot, now home to the De Hallen cultural centre, it hosts around 20 stalls and features everything from Vietnamese Bahn Mi to quinoa sushi and Dutch bitterballen. There are also a few bars serving beer, wine and G&Ts. Grab your food and people watch from the tables in the middle of the hall. The place gets super busy in the evenings and on weekends and is a great way to mix with the locals. Location: Bellamyplein 51. Tram 17 from Centraal will get you within 200 metres of the venue. Opposite the restaurant of the same name on Zeedijk is this snackbar serving some of the best Thai food I have had outside of Thailand. There is always a queue of people waiting for a table and staff do an incredible job squeezing them in into the tiny space. 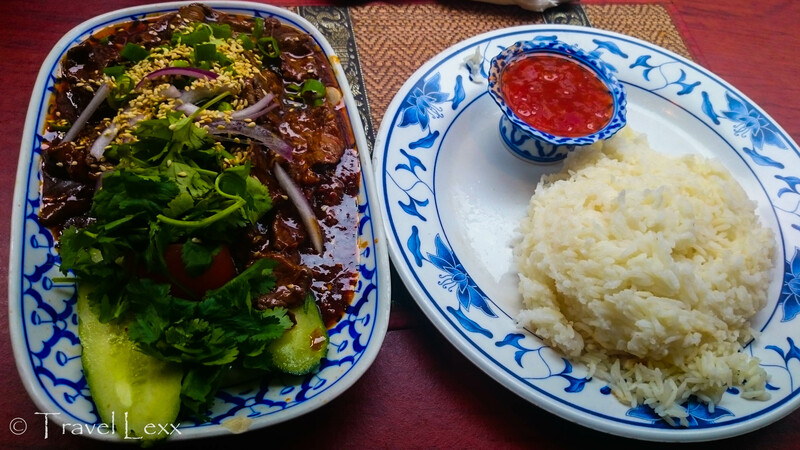 All the staples are available and I went for the delicious North Thai spicy grilled beef – it was out of this world! 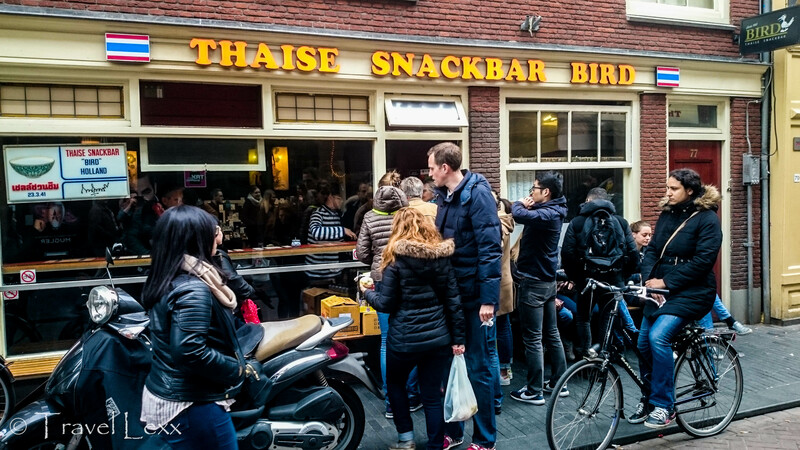 In a street where many places cater to tourists, it was refreshing to see tables full of locals – I highly recommend a visit here if you’ve had enough of fries and waffles! Location: Zeedijk 77. The place is within a 7-10 minute walk from Amsterdaam Centraal. 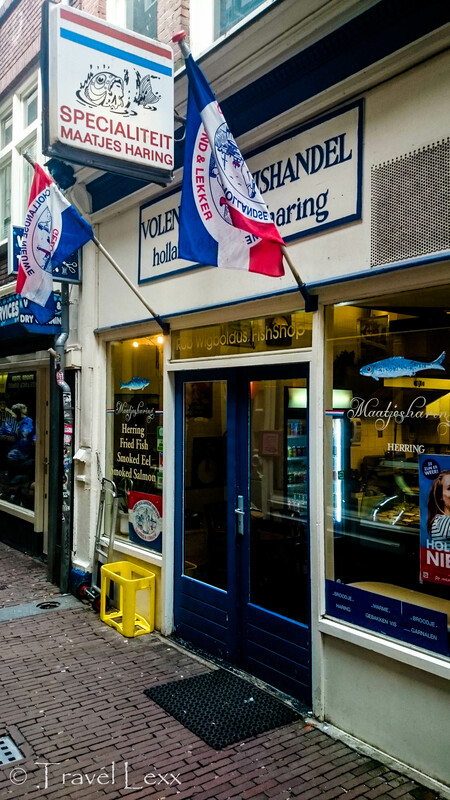 Just a stone’s throw away from Dam Square, down a nondescript alleyway is a tiny shop with three tables which serves some of Amsterdam’s best herring sandwiches. 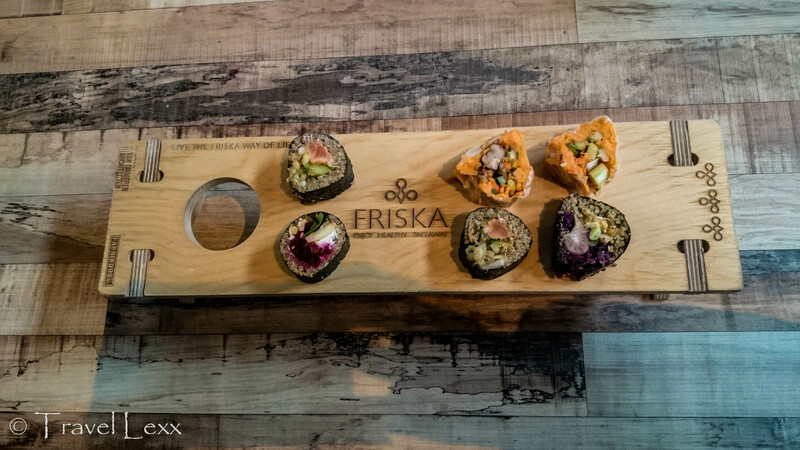 It may take a while to find but it was definitely worth it – the delicious fish almost melted in my mouth as I devoured my broodje (sandwich). The fish is fresh and you can choose from white and brown rolls. There are other fish available but make sure you try the original! Location: Zoutsteeg 6. Walk towards Centraal station on Damtrak and duck into the alleyway between a tourist info office and the De Waal bakery. The shop is a few metres ahead on the right-hand side. Those staying in the newly-opened Generator hostel in Amsterdam’s Oost area are in for a treat. 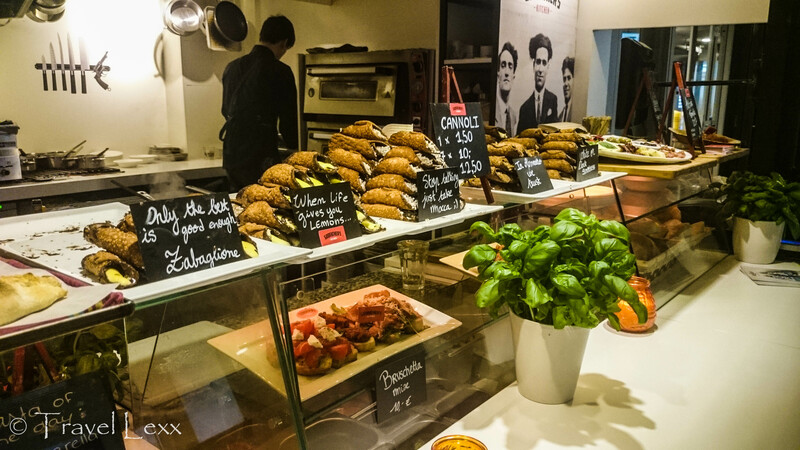 The café serves great sandwiches, salads as well as pizzas which are a staple of this hip hostel chain – I was surprised at how good the food was and there were plenty of healthy options too. They also have a very decent beer and wine list. 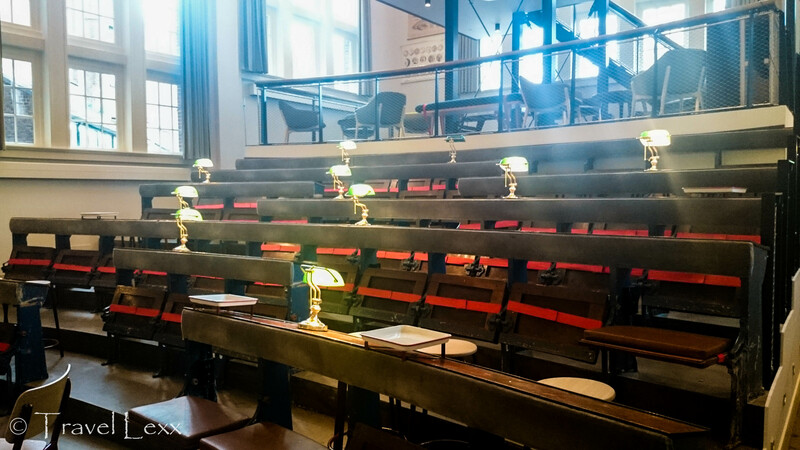 The Auditorium Bar, through a doorway just metres away has a unique look about it – it has retained its lecture hall-style seating from its days as a university building – and is a great place to grab a drink with friends. You do NOT have to be staying at the hostel to eat and drink here. Location: Mauritskade 57. Generator is located right next to Oosterpark, a popular green space with Amsterdammers. Take tram 9 from Centraal or 10 from the Museum Quarter heading east. Ok, so this isn’t technically a specific place but Amsterdam is a great city to grab some food and enjoy a picnic in. Head to the popular Albert Heijn supermarket chain (don’t worry, they are everywhere in The Netherlands) and grab some fresh bread, cheese and cold meats or a ready-made salad and find a spot in one of the many green spaces in the city – Vondelpark is a great option and isn’t too far from the centre. Oh and don’t forget to grab one of their amazing freshly squeezed juices – Orange and Mango is so so good! 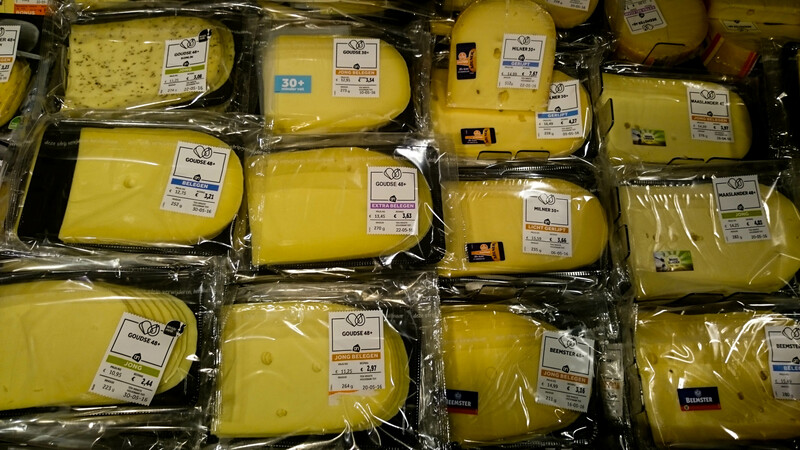 HEMA is great for their snacks and fast food counters but they also have salads and juices available. Location: Take your pick! Vondelpark is reachable by trams 1,2 and 5. Oosterpark is a 20 minute ride away on tram 9. 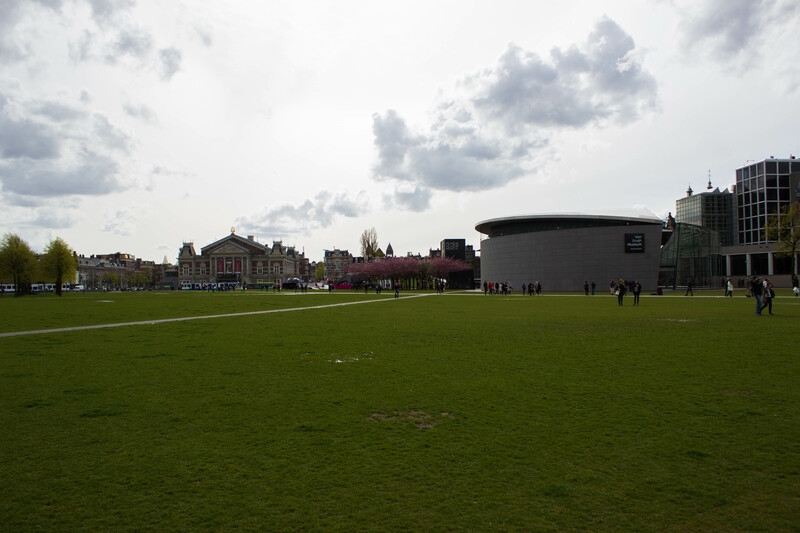 Museumplein is a great place to take a break from all the sightseeing and just people watch. 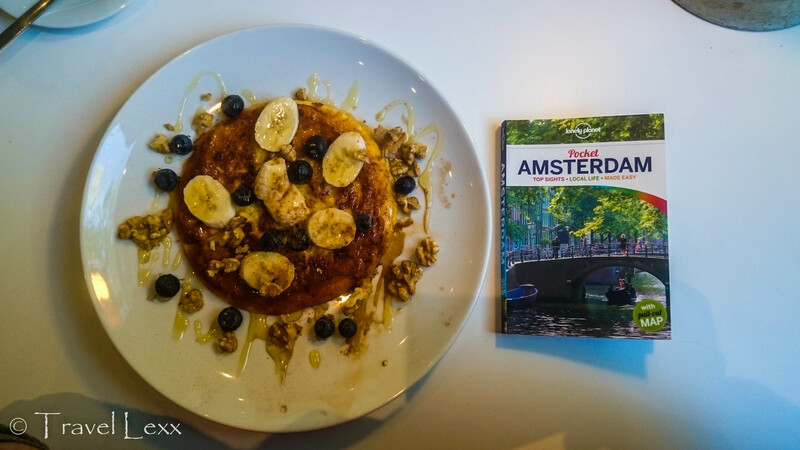 What are your favourite places to eat in Amsterdam? Let me know! 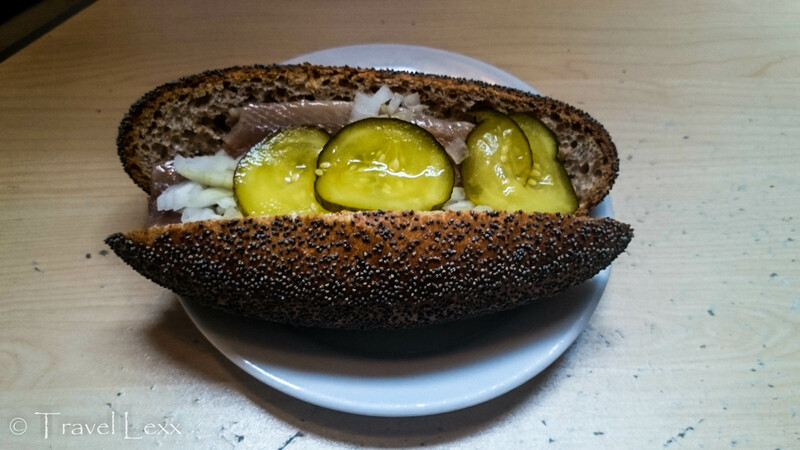 This entry was posted in Netherlands and tagged amsterdam, europe, food, food market, foodhallen, herring, netherlands, picnic, restaurant. cafe, Thai, travel. We did go to a steak restaurant in Amsterdam but I ended up having a massive salad! I intend to go back soon and would love to find some other great food spots! I must have been following in Angie’s steps, as all i can remember eating was pancakes, chips and mayo! Great detailed post Alexei! I’m definitely bookmarking this one for our next visit, which might be next year we hope! The food market looks like my favourite, the G&Ts sold it to me! Did you spend your whole time eating?! Haha I did find some time to sightsee and walk around to burn off all the food and beer! I will pin this one. Hopefully visiting Amsterdam next year and this will come in handy. All the food looks delicious and I plan to try as much of it as I can! I love picnics so a little bit if down time after sight seeing would be perfect. Thanks for sharing this list. What a great list! Now I want to return to Amsterdam to check out the food scene. Honestly, I don’t know much about Amsterdam, although I hope to get there some day in the next few years! I had no idea the food scene offered so many good and healthy choices! Grabbing food for a picnic and strolling through markets sounds great to me. It’s so quintessential! I can’t eat waffles unfortunately because of my diet so I had to longingly look at them throughout the trip! I visited Amsterdam last year but didn’t get chance to check out any of these places. We camped just outside of the city and cycled into the centre, so did had huge appetites from riding around each day. Love Thai food and the protein pancakes look cool – would be something I would try. Tried to make them once but they turned out pretty disgusting! This is great! We will be in Amsterdam next month and I have no idea yet on what to eat. Thank you so much for sharing! 🙂 I’m excited to try Rob Wigboldus Vishandel! Thanks Jen! I hope you like it! It’s tricky to find but it’s worth it! Will definitely have to save this post for when I get round to visiting Amsterdam (which will hopefully be soon!) All the food looks delicious, thanks for sharing! I’m about to book my next visit so might have to do an updated version of the post soon! Thanks Helena! I try and go for the healthy stuff when I travel but Amsterdam has loads of other yummy stuff as well!